Welcome to Oakhurst Shores! Nestled on a quiet street, this rare opportunity to join this family friendly neighborhood in the Seminole School District is now available. This home features a bright great room with a loft overhead leading to its own balcony. New vinyl flooring throughout adds to the spacious open floor plan. Enjoy your morning coffee on the screened porch. Or have fun entertaining family and friends on the back deck with plenty of room to set up a grilling area! Look for the extra storage space inside. Bonus! Additional storage is also available with the oversized shed in the backyard. Nice size lot makes adding on a fun thought for the future. Plenty of parking for your guest(s) with the circular drive and plenty of room to include parking for a trailer or RV. Have a boat? 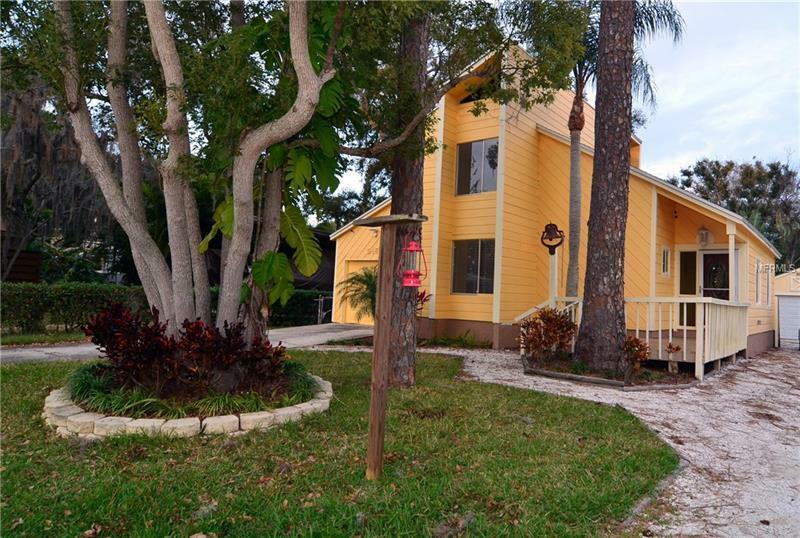 You can store on your property and Bay Pines Boat Ramp - only 3 miles from home. Roof was redone in 2014. Location is everything!! This neighborhood is just down the road from Seminole City Center for entertainment, shopping, fitness and dining needs. This home is a Must See!